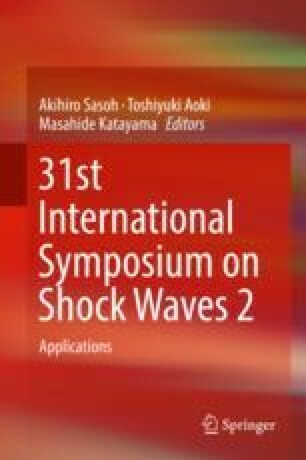 This paper describes initial visualisation experiments performed using a novel small-scale impulse facility, driven by two liquid-coupled pistons to provide rapid compression of gas in the driver tube and a sufficiently small shock tube diameter to not require a diaphragm. The facility is designed to be able to investigate the heat transfer behaviour of rapidly compressed gases at small physical scales. We present the design of the facility, comparison between predicted and measured piston motion and high-speed schlieren imaging of the resultant subsonic jet, using carbon dioxide as the test gas. The piston speed and displacement were much smaller than expected, due to the fit of the o-rings on the lower piston to the inner bore of the compression tube being too tight to allow free movement of the lower piston.